Russian rabbi and leader of the Ḥasidim of the Ukraine; born at Medzhibozh, government of Podolia, about 1750; died there in 1810. He was the son of Adele, who was the only daughter of Israel Ba'al Shem-Ṭob, founder of Ḥasidism, and who, on account of "the supreme qualities of her soul," had conferred upon her the epithet of "the most righteous." According to, Walden ("Shem ha-Gedolim he-Ḥadash," B. 55), Adele gave birth to twins, Moses Ḥayyim Ephraim of Sudilkov, author of "Degel Maḥaneh Ephraim" (The Flag of the Camp of Ephraim), being Baruch's twin brother. While Ephraim was a man of letters and a theorist, Baruch was practical, and for more than thirty years held the leadership of the Ḥasidim of Podolia at Tulchin, and later at Medzhibozh, the former seat of his grandfather. He ruled with great adroitness; traveling around his diocese in luxurious carriages, and collecting large sums of money and presents from his numerous disciples. Baruch was everywhere received with great enthusiasm. The rich and influential looked for his protection; the masses, for his help. His income was immense. In Medzhibozh he held a court, famous for its splendor, and rivaling those of reigning princes and Polish magnates. He even kept a court-jester, Hirschele, of Astropol. There were continuous noisy festivals, carousals, and dances, attended by an excited crowd of enraptured Ḥasidim. 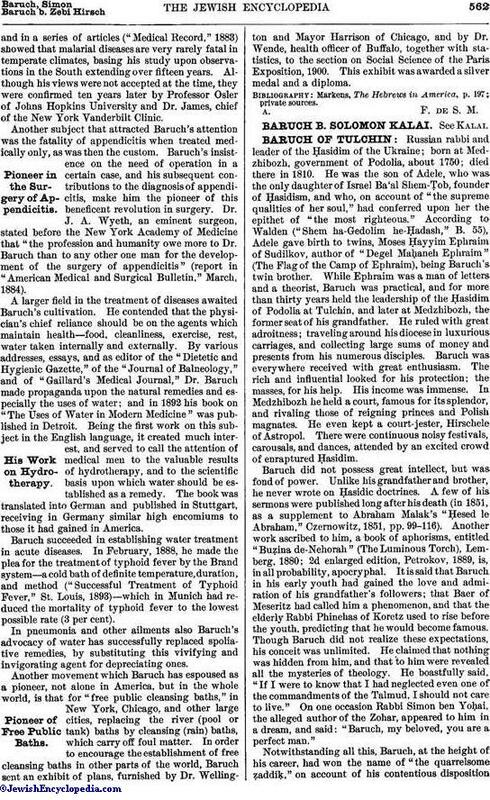 Baruch did not possess great intellect, but was fond of power. Unlike his grandfather and brother, he never wrote on Ḥasidic doctrines. A few of his sermons were published long after his death (in 1851, as a supplement to Abraham Malak's "Ḥesed le Abraham," Czernowitz, 1851, pp. 99-116). Another work ascribed to him, a book of aphorisms, entitled "Buẓina de-Nehorah" (The Luminous Torch), Lemberg, 1880; 2d enlarged edition, Petrokov, 1889, is, in all probability, apocryphal. It is said that Baruch in his early youth had gained the love and admiration of his grandfather's followers; that Baer of Meseritz had called him a phenomenon, and that the elderly Rabbi Phinehas of Koretz used to rise before the youth, predicting that he would become famous. Though Baruch did not realize these expectations, his conceit was unlimited. He claimed that nothing was hidden from him, and that to him were revealed all the mysteries of theology. He boastfully said, "If I were to know that I had neglected even one of the commandments of the Talmud, I should not care to live." On one occasion Rabbi Simon ben Yoḥai, the alleged author of the Zohar, appeared to him in a dream, and said: "Baruch, my beloved, you are a perfect man." Notwithstanding all this, Baruch, at the height of his career, had won the name of "the quarrelsome ẓaddiḳ," on account of his contentious dispositionand imperious attitude toward other ẓaddiḳim in southwestern Russia, notably in his great conflict with Shneor Zalman of Lyady. 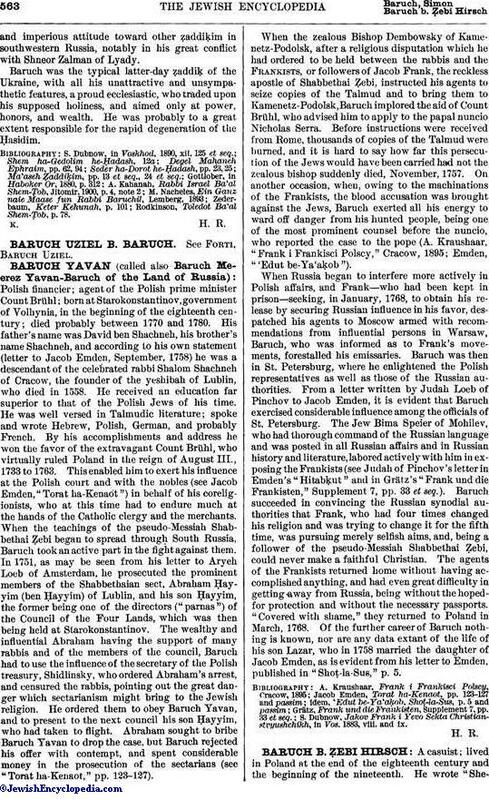 Baruch was the typical latter-day ẓaddiḳ of the Ukraine, with all his unattractive and unsympathetic features, a proud ecclesiastic, who traded upon his supposed holiness, and aimed only at power, honors, and wealth. He was probably to a great extent responsible for the rapid degeneration of the Ḥasidim. Rodkinson, Toledot Ba'al Shem-Ṭob, p. 78.